Post a write up and pictures of Homemade Lionel (or other) style cars or engines you have made or modified or scratch built. 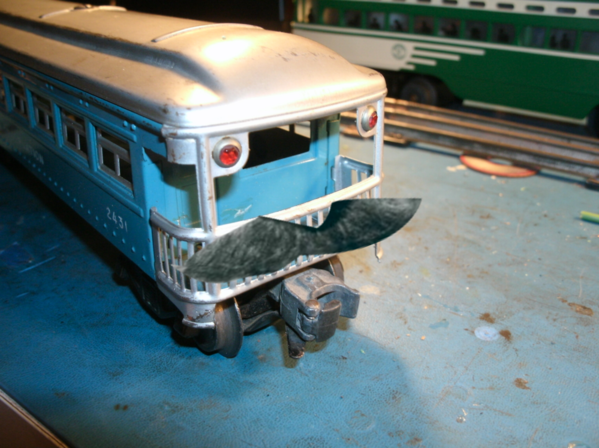 I have made homemade copies of several Lionel cars when I cannot find them or afford them at the time. I will start with my recently completed Lionel 6413 Mercury Capsule transporting car. After looking for a reasonable or inexpensive Lionel 6413 Mercury Capsule transporting car or raised-center flat car body (they are rather hard to find and I have never seen one at a train show) I decided to make one. 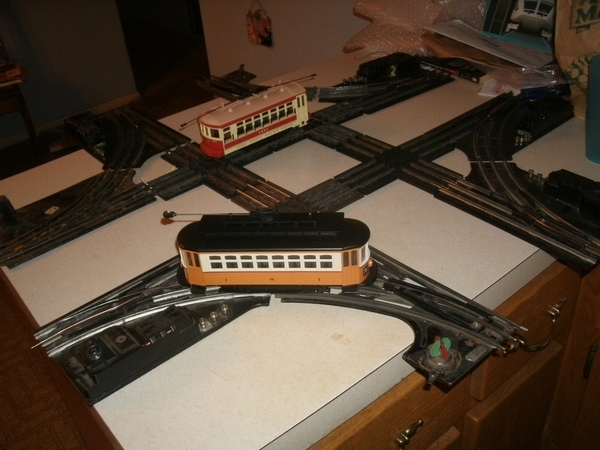 I have the other two center raised-center flat cars. 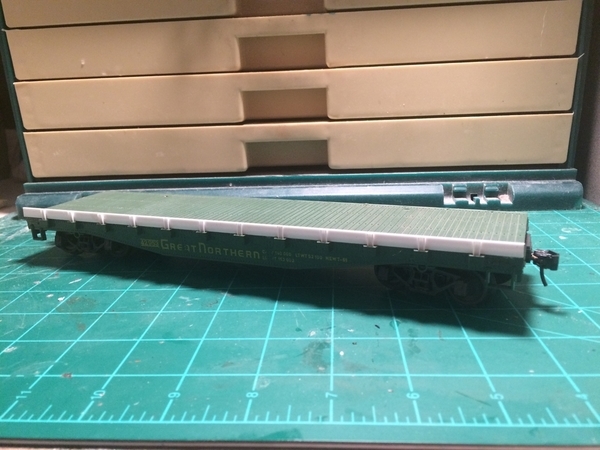 The first car is the Lionel ACMX 6519 Allis-Chalmers condenser car and it needed a raised-center flatcar deck to handle the tall height of the condenser (made 1958-61). 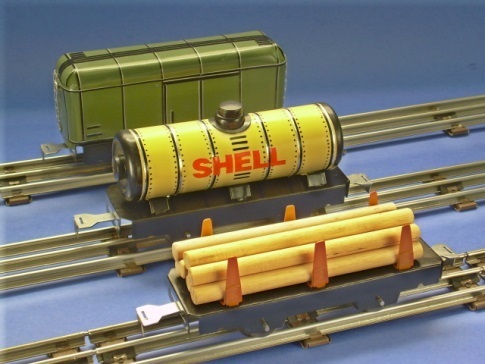 Then Lionel made the Lionel TLCX 6544 Missile Firing car using the raised-center flat car body from the 6519 (1960-64). Later, the Lionel TLCX 6413 Mercury Capsule car (made 1962-63) was made from the Lionel Allis-Chalmers Condenser raised-center car body and the Mercury Capsule from the Lionel 3413 Mercury Capsule Launching car Missile. 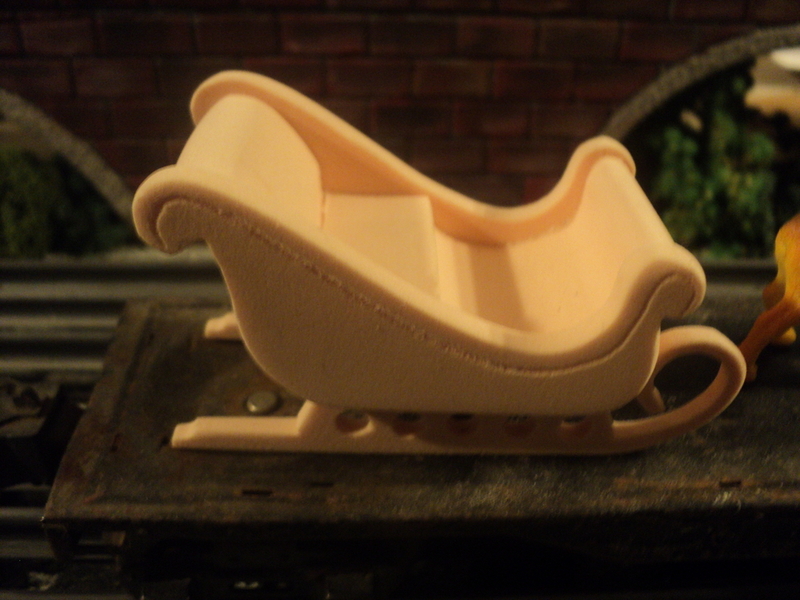 This let Lionel use the body molds from the Lionel Allis-Chalmers car for to two new cars, and to double use the Mercury Capsules, a typical thing Lionel does. 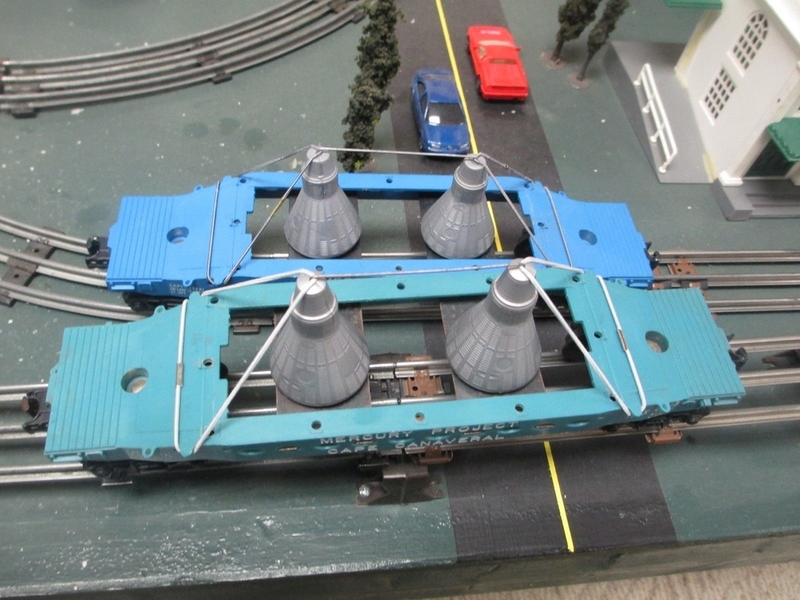 Here are a couple of the Lionel 6413 Mercury Capsule transporting cars I want to home make (picture from the internet). The slightly aqua green blue car in the front is rarer and brings more money. Notice the track can be seen in the openings between the two metal straps holding up the Mercury Capsules. Zero money was used to made the car. 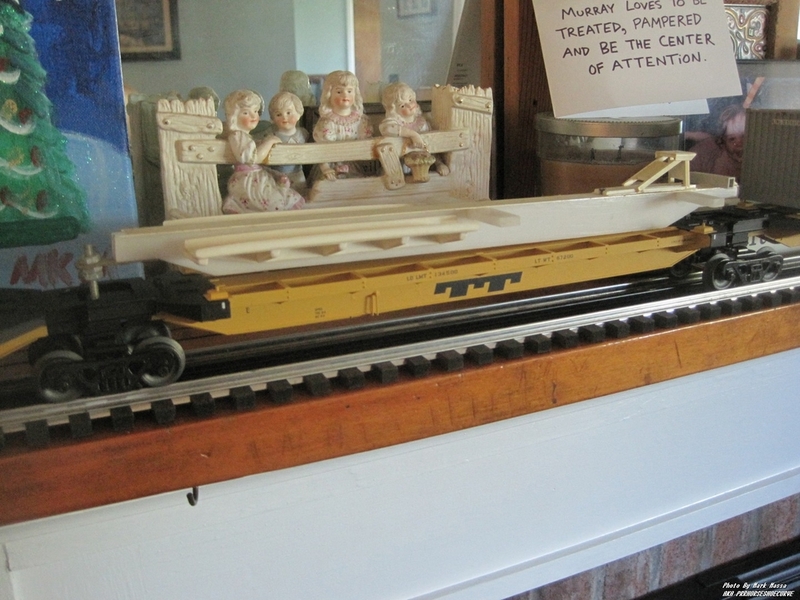 A Lionel 6800 flat car, with a broken corner (the plastic was harder than normal after being stored in the hot attic) and no trucks and wheels was found. 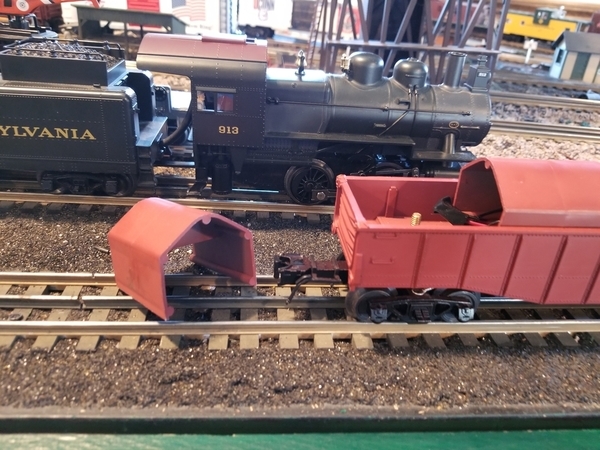 The second car used was a small Lionel un-numbered flat car complete with trucks in my junk box. Plastic from a discarded daily desk calendar base and a plastic paper easel were used. On hand glue, blue paint, two toy optical viewers and letter decals and rub-on numbers were used. I did get to spend many hours of fun time building the car. 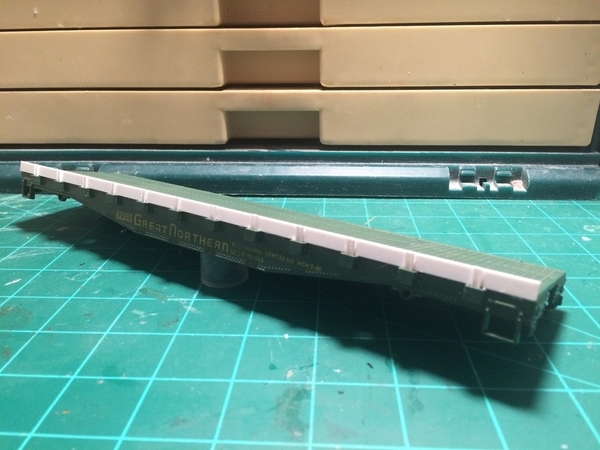 For the body of the Mercury Capsule car, the Lionel 6800 flat car was used upside down to make the raised centered car and cut out the middle of the brown flat car leaving the trucks. The ends of the small Lionel flat car with trucks were band sawed off to add to the cars height. 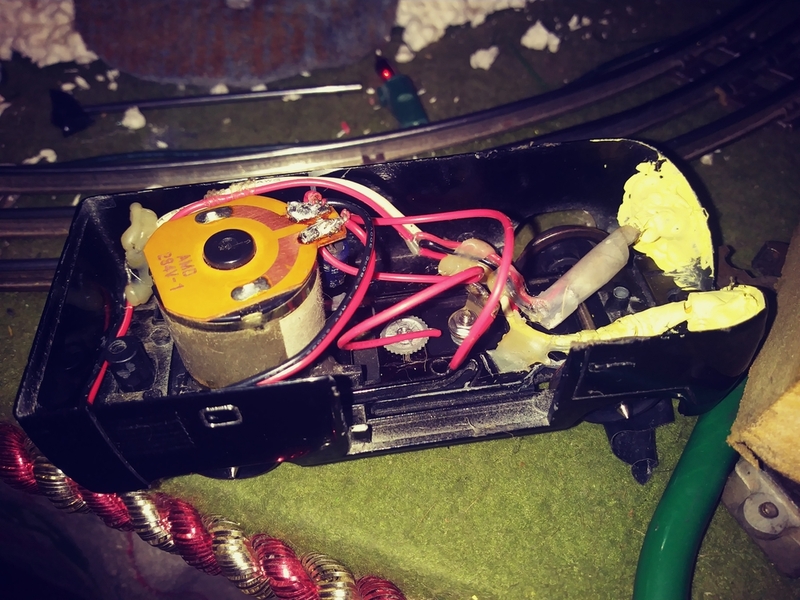 I patched the broken corner of the 6800 car and added plastic to extend the skirts of the trucks. I decked the top ends of the car with decking left over from the short flat car. Two small lugs were glued on to the edge to act as hooks for the elastic cord that would hold down the Mercury capsules. 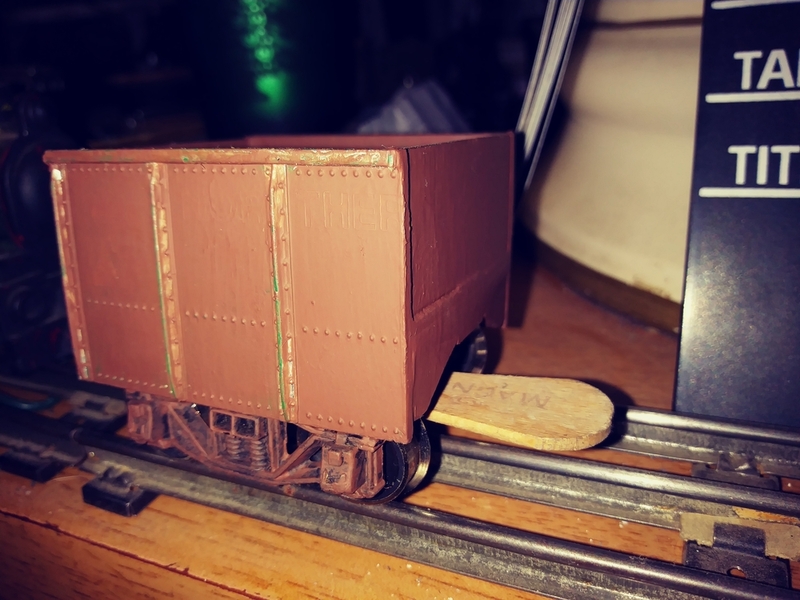 I added in some seams to the side of the raised center car and added skirts to the trucks and extended the raised hump as seen in black plastic in picture below. I made the rest of the top decking from plastic with holes for the Mercury capsules. I made the deck a little wider than the car so personal can walk on the deck alongside the capsules. 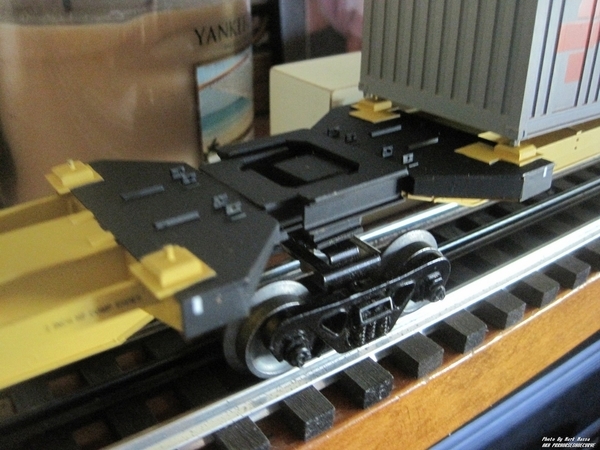 The Lionel 6413 is wider in the middle than at the ends. The Lionel 6413 holds the capsules via two metal brackets across the near bottom of the car with opening from the top to the tracks, presenting a unfinished look. The Lionel Mercury capsules have cylinder on the bottom to simulate the mercury capsule retro rockets and the capsule is the same one used on the Lionel Mercury capsule rocket with the Lionel 3413 Mercury Capsule Launch Car and Rocket. The real Mercury capsules would never be transported with the retro rockets attached. My capsules set on the bottom of the car and the bottom is enclosed, the kind of job one would expect from NASA and the US Government. The real Mercury capsules are only 6 ft in diameter and 6 ft tall and would easily fit in a gondola or box car with wide doors so the Lionel Mercury Capsule cars is a fun item and allowed the use of existing molds to make and sell another interesting car. My Mercury capsules are made from two toy optical viewers that lets the the grand kids see diamonds moving around when viewed and rotated. I took out the clear plastic end to make the cones lighter. I added some heavy paper strips to make the cones look more like they had heat shields on the sides and show the door and window. The astronaut sits with his back to the bottom heat shield and views through the window. 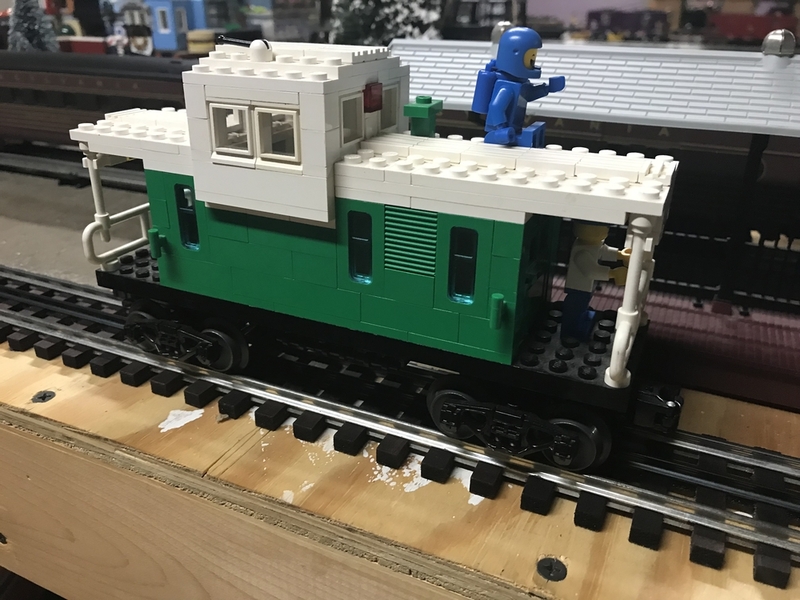 I painted the car with Model Masters 35183 F S Bright Blue paint which I had and is fairly close to the Lionel 6413 color. I then added “NASA” decals as I did not have room or letters for “Mercury Project Cape Canaveral” that Lionel used. 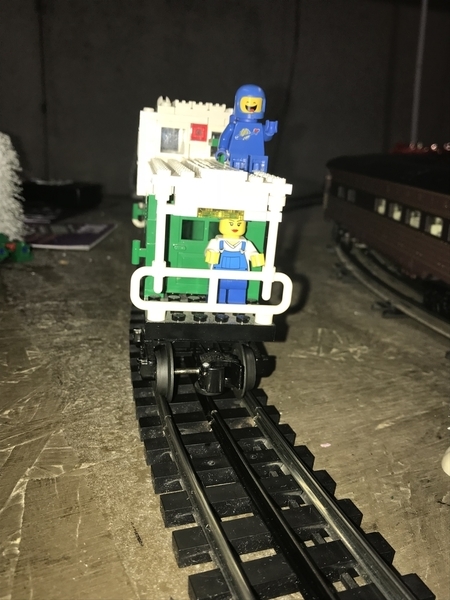 I also added press on numbers of 6413, not as neat as I wanted and all I had room for. Clear glossy spray was used to seal on the lettering. I added a metal washer to the top of each Mercury Capsule with clear caulking to allow the Lionel Gantry Magnetic Crane to lift them up and give another load for crane operation. I think the Mercury Capsule car came out very well and it can serve as another car and load to use my Gantry Crane for, sort of an action car after all. Let’s hear from a few of you all car builders about your cars. 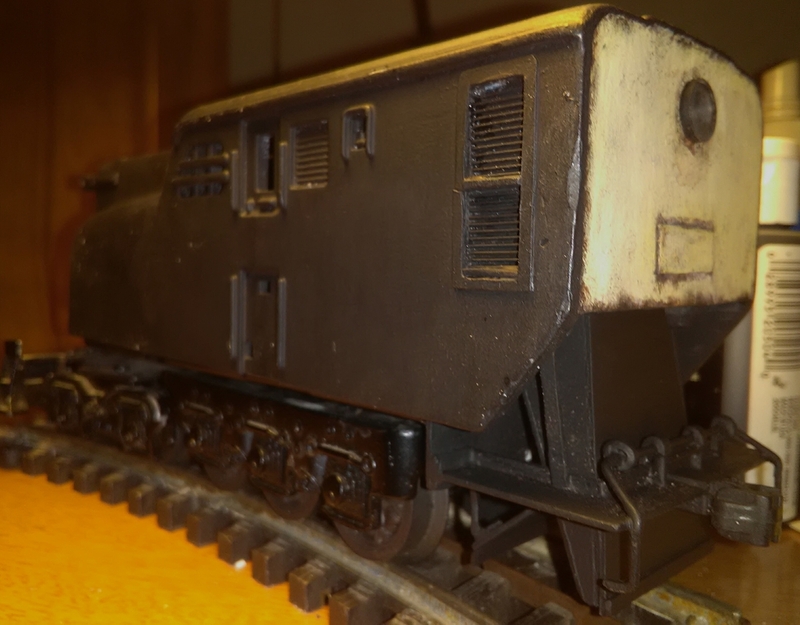 I find fixing up a common car into something more special or useful a satisfying part of the model train hobby for me. 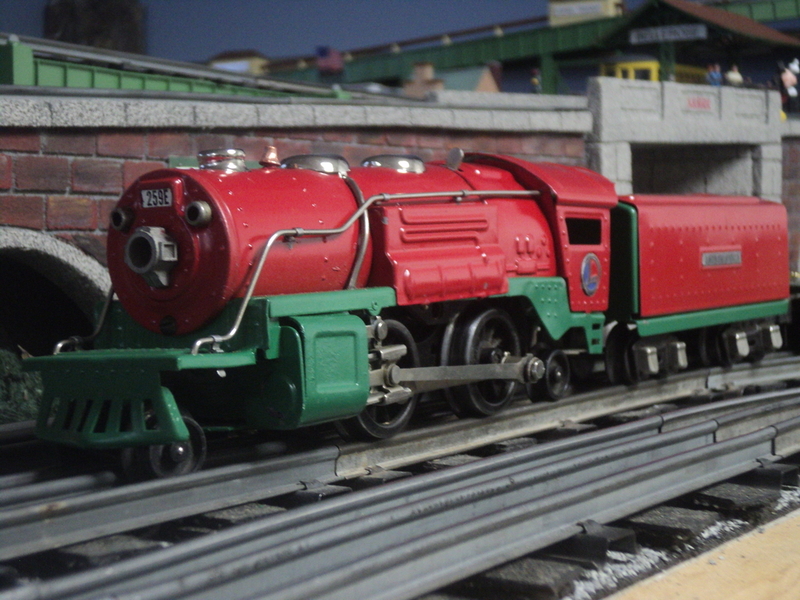 I have several more to share but do not have the pictures of the building process like the 6413. Most of them are painting and lettering projects. Wow that's really great Charlie. 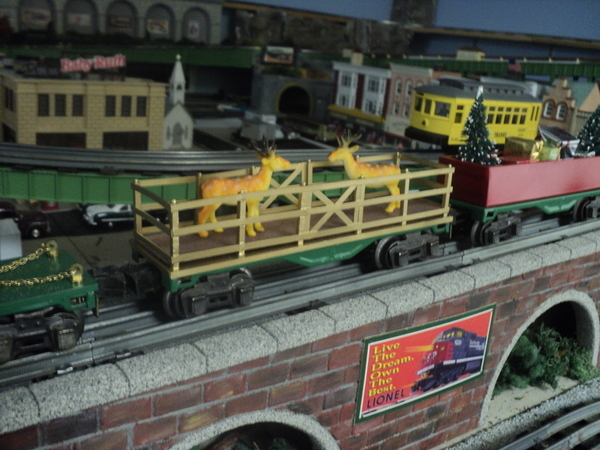 Love that you can also use the gantry crane to move them around. Fantastic write up as well. 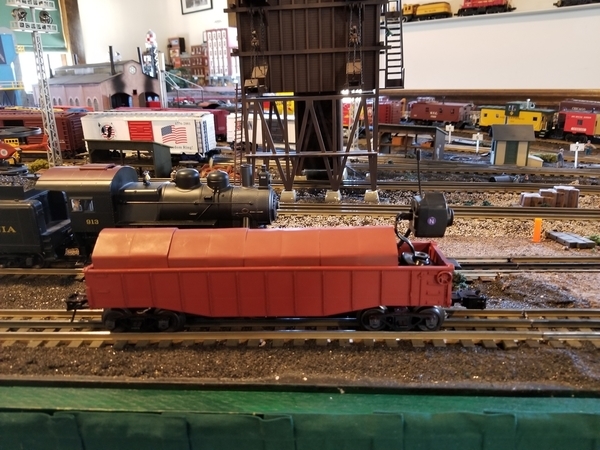 This isn't quite on your level, but about a year ago, I repainted a 244 Lionel Scout locomotive pink for my oldest daughter in homage to Lionel's "girl's set". 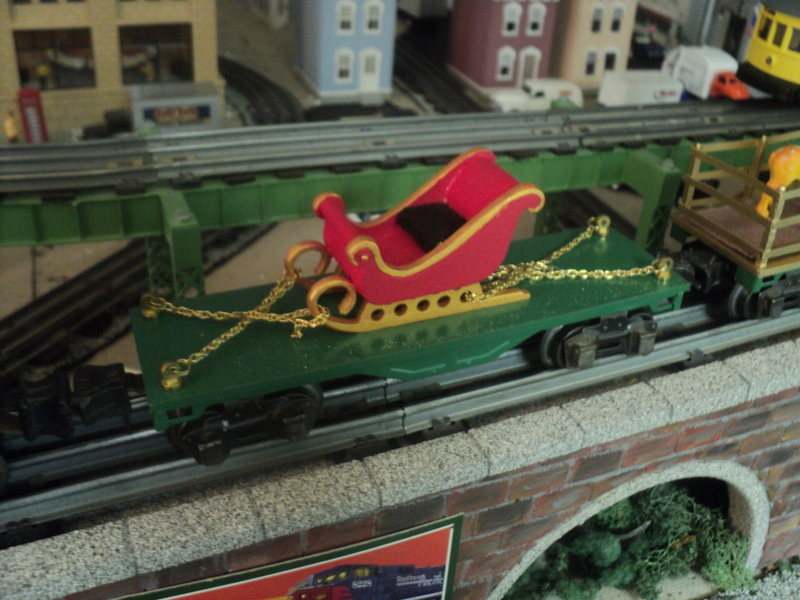 I also included diamond rhinestones over the coal load and left "Lionel Lines" visible on the tender. She ended up loving it Now she has her own to play with her older brother. 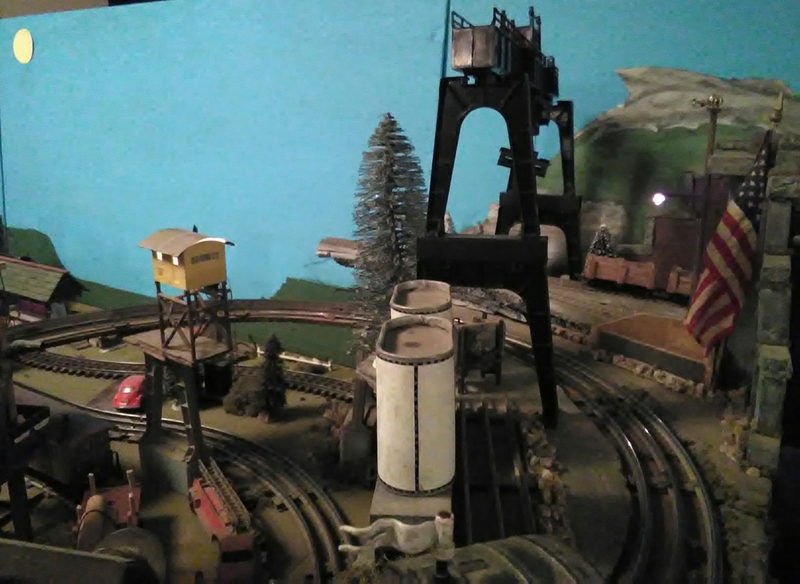 Charlie, your 195Os action packed layout thread inspired me to go forward and get a modest layout up and running in a 5x9 space. Thanks again for sharing all of your great ideas. I'm not sure if this is the type of homemade cars you mean, but I built these two cars using a wood base and resin-cast sides and roof. They were scratchbuilt not modified, so don't know if this counts or not. Here's a sampling from over the years! thats really cool, keep them coming guy! JD replied "Charlie, your 195Os action packed layout thread inspired me to go forward and get a modest layout up and running in a 5x9 space. Thanks again for sharing all of your great ideas. " JD Thank you for the kind words. 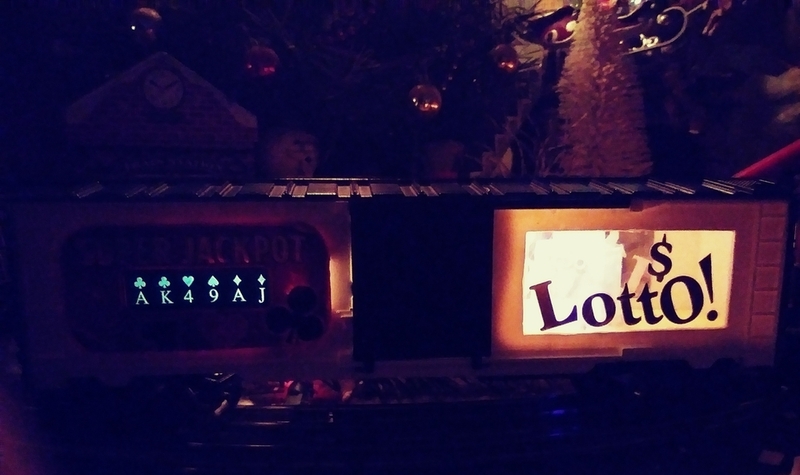 I enjoyed building it, and writing it up and you comments fulfill the hopes I had when writing up the post. I really enjoyed your Razorbacks adorned cars and engines. I have lived in Razorback country 3 separate times. Also liked your giraffe engines to go with the Lionel giraffe cars, one of my kids and then grand kids favorites. 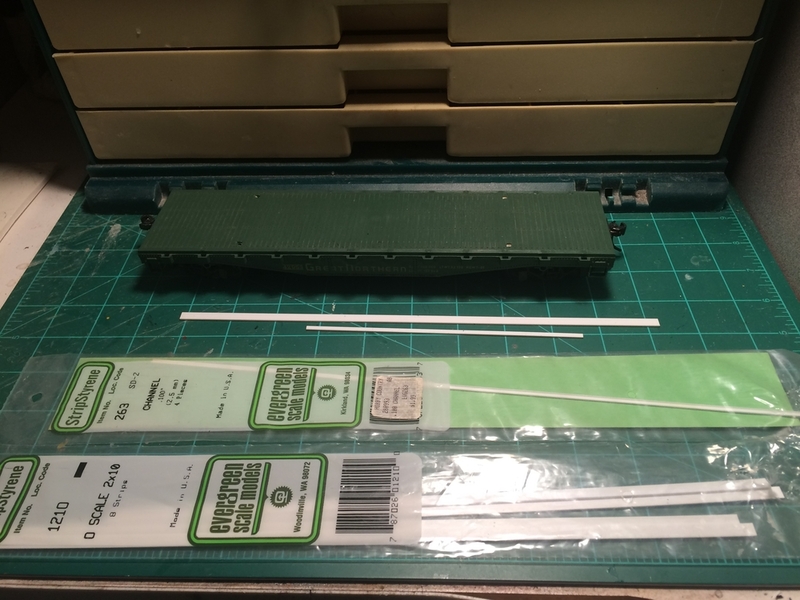 I had several Marx and Lionel Scout type 8 inch box cars and time to make some homemade copies of some of my Lionel favorites. A US Mail car was painted up. Press On letters were used lettering and clear coated for all cars. This one has doors that open. Another homemade car was a Gold Bullion car. Windows were cut in both sides with a Dremel Moto tool with saw blade and a razor saw and plastic windows were added. Gold bars were made from kitchen match sticks painted gold. 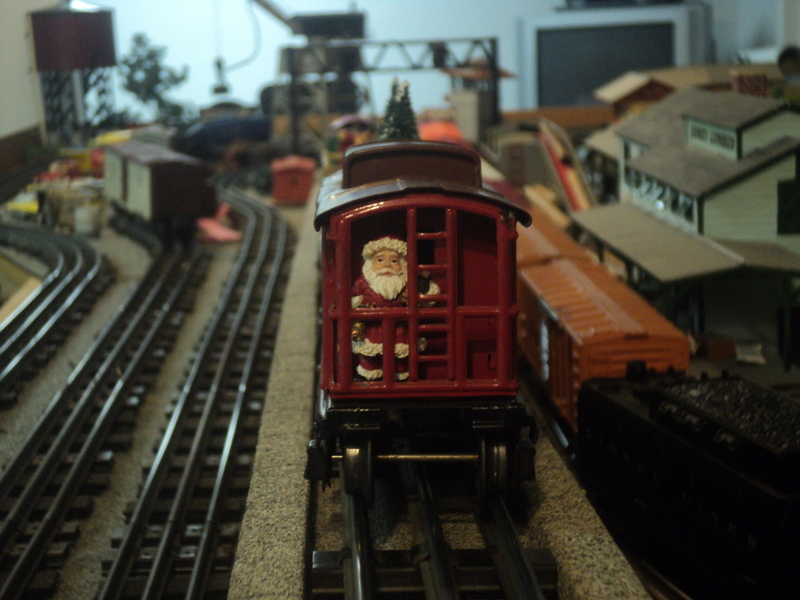 Two 12v or 7v in series mini Christmas lights were added, a feature the Lionel version does not have. A light pick up was made from brass shim stock. Detail of homemade Pickup is below. 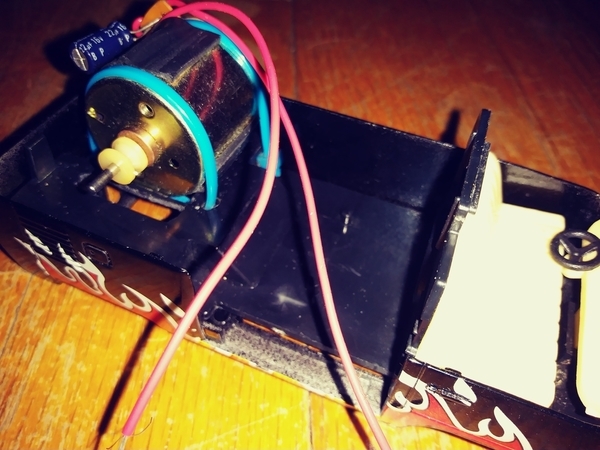 A piece of tin can was added to improve durability of shim stock. Come on you closet Homemade car fans, lets see them. 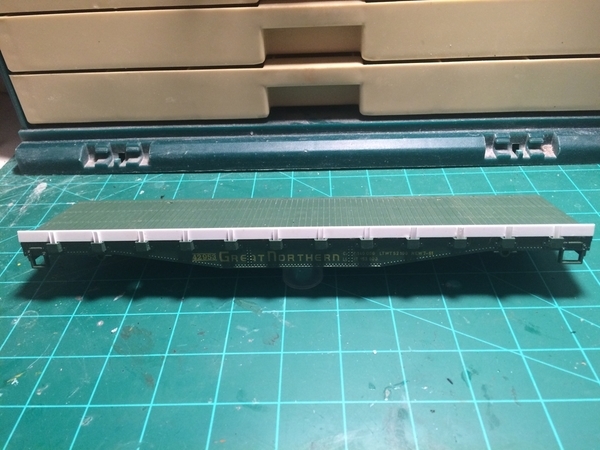 These below are some of my of my slow projects... A Stretched 265E commodore Vanderbilt and 15" long Pullmans. Custom N.T.T.X. 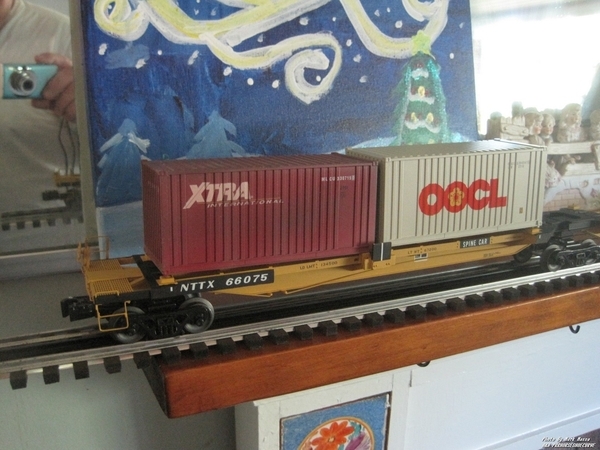 5 unit Container Spine car. The White Spine unit is what this car was originally developed from. PRR NDa made from a Gloorcraft 4 wheeled ND kit. Keep those great Homemade cars a coming. I have really enjoyed seeing them and knowing other OGR members like making them and saving money. Here are some of details of my Homemade Centerline Track Cleaning Car, a $3 to $4 version of the brass Centerline, O gauge track cleaning car and it works super. The price of the Centerline Track Cleaning Cars is quite high listing for $133 plus postage. It is made from brass. 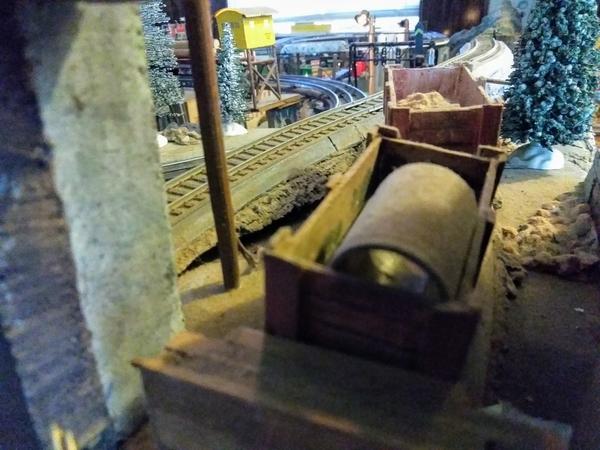 The brass Centerline car is a work of art and not required to do a mundane job like cleaning O gauge track. 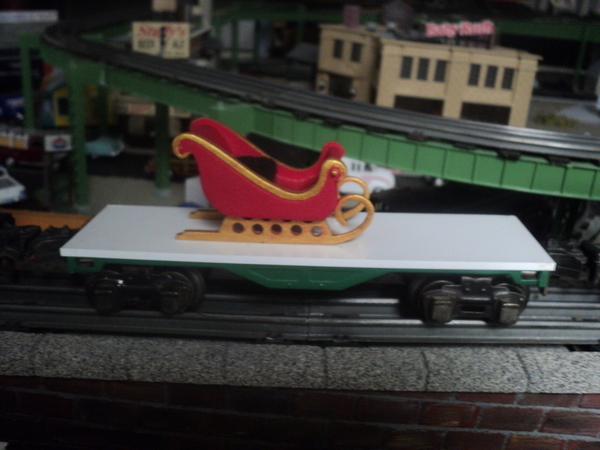 I like the cars design as it has no pads to glue on to replace and no pad motor like the Lionel model. I worked from a picture of the Centerline track cleaning car and made a body out of wood. The heavy weight of the brass for Centerline is not needed to clean the track as the roller brush rolls freely in the center of the car. The center pit of my wooden version was lined with aluminum flashing and glued it in with epoxy. This area gets wet from the cleaning solution and that would attack the paint and wood of the body. 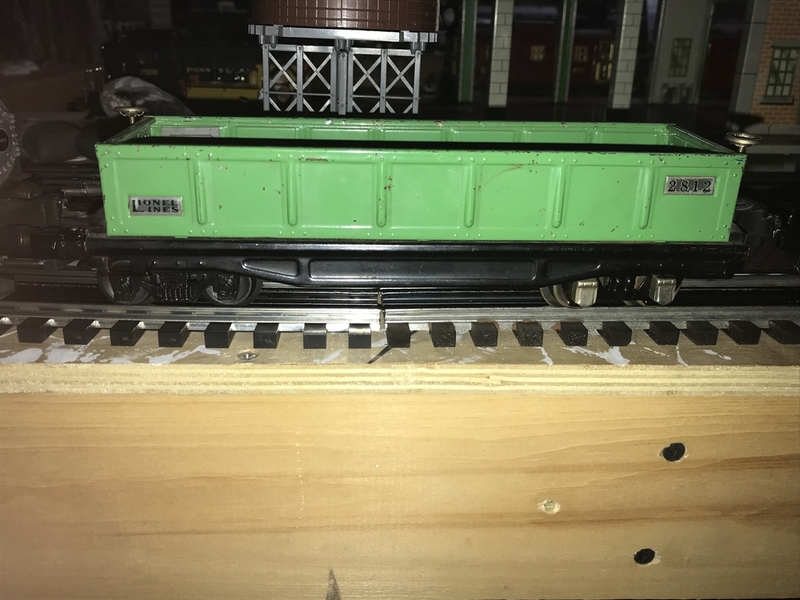 I used 1 inch diameter mini paint rollers for the cleaning brushes and cut them 1/8 inch of less than the width of the pit (the rollers were the only out of pocket money spent). Pit is 2 7/16 in wide, 2 7/16 in long and 1 5/8 in deep using a part of 1 in diameter paint roller 2 5/16 in long. I used a short piece of ½ inch pipe coupling as weight inside the cleaning brush. Rubbing alcohol is normally used the cleaning solution. Two or three extra dry cleaning brushes are used after the alcohol saturated cleaning brush and run until the all the wet solution is removed from the track and the dry cleaning brushes show little of the dirty picked up cleaning solution. The dirty cut off mini paint rollers can be washed in the home washing machine by placing them in a small nylon net bag used for washing small items. 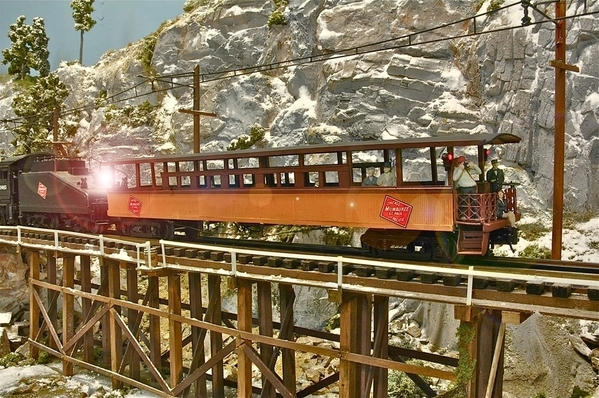 Gondola camera car. Covers are shutter packing protectors. Here are some of details of my Homemade Centerline Track Cleaning Car, a $3 version of the brass Centerline, O gauge track cleaning car and it works super. The price of the Centerline Track Cleaning Cars is quite high listing for $133. It is made from brass. 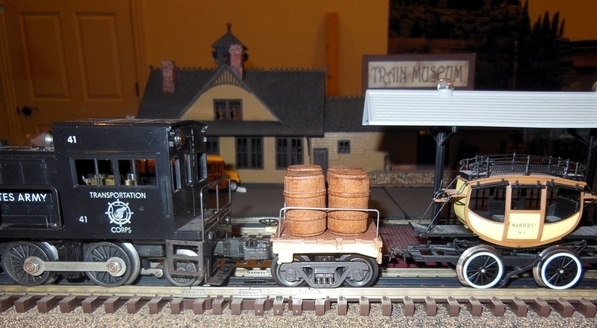 The brass Centerline car is a work of art and not required to do a mundane job like cleaning O gauge track. I like the cars design as it has no pads to glue on to replace and no pad motor like the Lionel model. 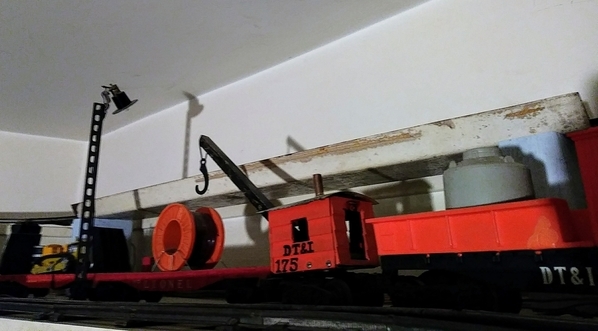 I worked from a picture of the Centerline track cleaning car and made a body out of wood. The center pit was lined with aluminum flashing and glued it in with epoxy. This area gets wet from the cleaning solution and that would attack the paint and wood of the body. Very nice on the car design and especially smart on the weight to weigh down the roller! Glad to know it works well. Quite a long time ago, I bought an MTH 19th Century reefer. 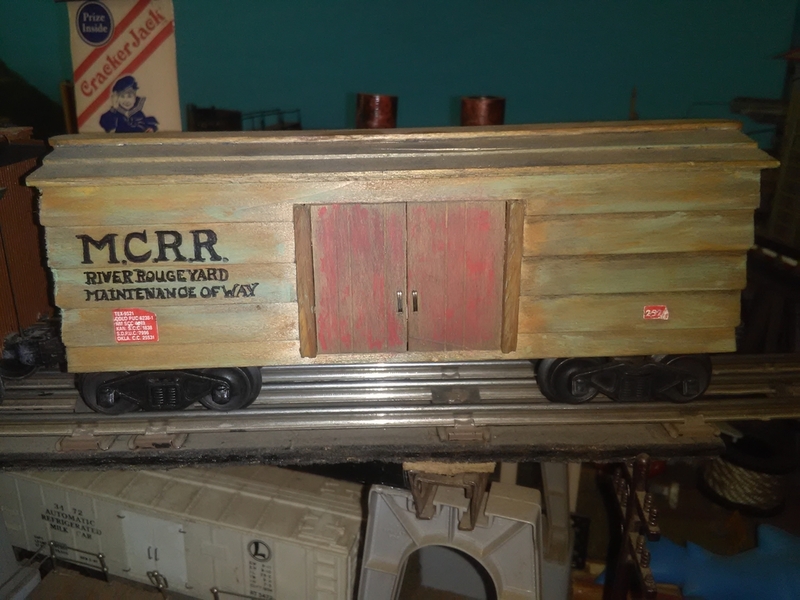 Shortened the frame; relocated the trucks; and replaced the body with my scratch built reefer with the doors positioned toward the ends. The model is suposed to represent a 34' car I saw in a photo. Fun project. I really like your camera car covers. I liked using a piece of throw away packing for some worthwhile project. Nice job on the homemade Mercury Capsule cars. 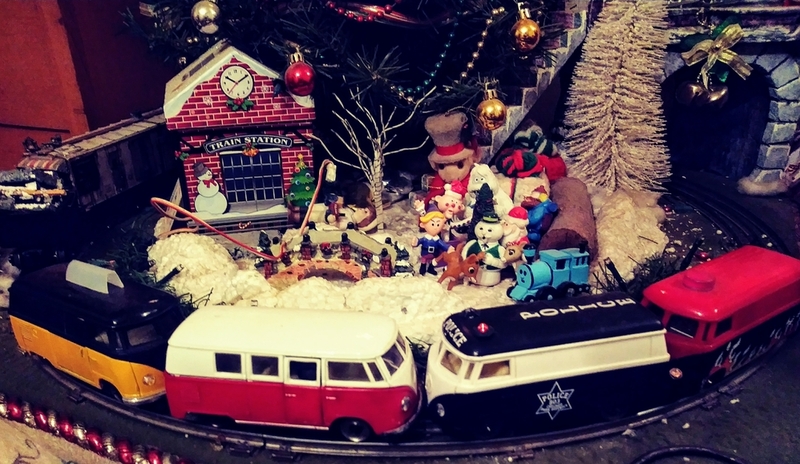 The Lionel car is a favorite of mine. I've run across quite a few of them missing the capsules. 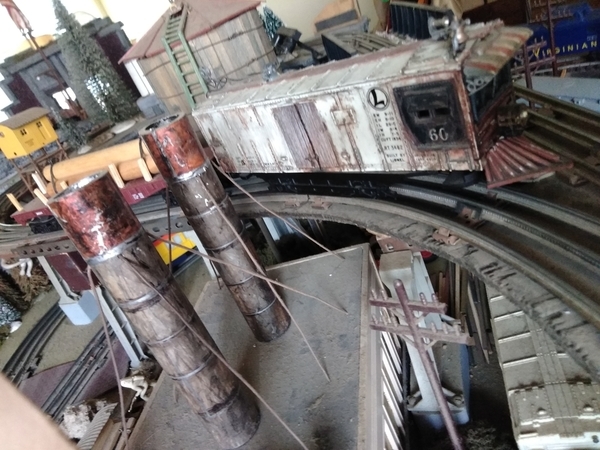 I see complete ones on EBay, but not too often at the train shows I've attended. The capsules and the metal plates that hold them have been reproduced. The first repros were probably done around 20 years ago, so they could have the look of age to them. The price on the reproductions was through the roof for a while, but I see that Train Tender has them for $7.50 each now. 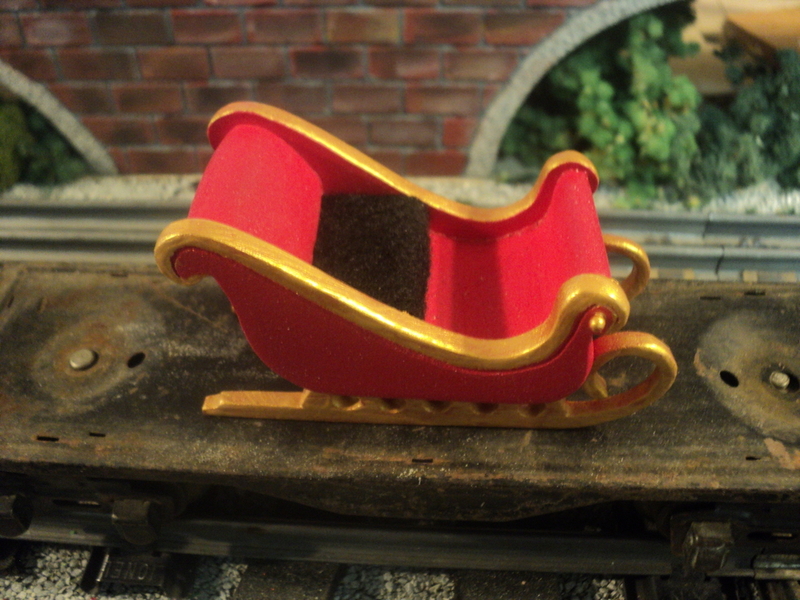 I built this magnet car to pickup ferrous material along the track. It collects everything from screws/nuts that may have fallen off to fuzzies/filings from any cutting or drilling activities. The first. I make due mostly with things "on hand". 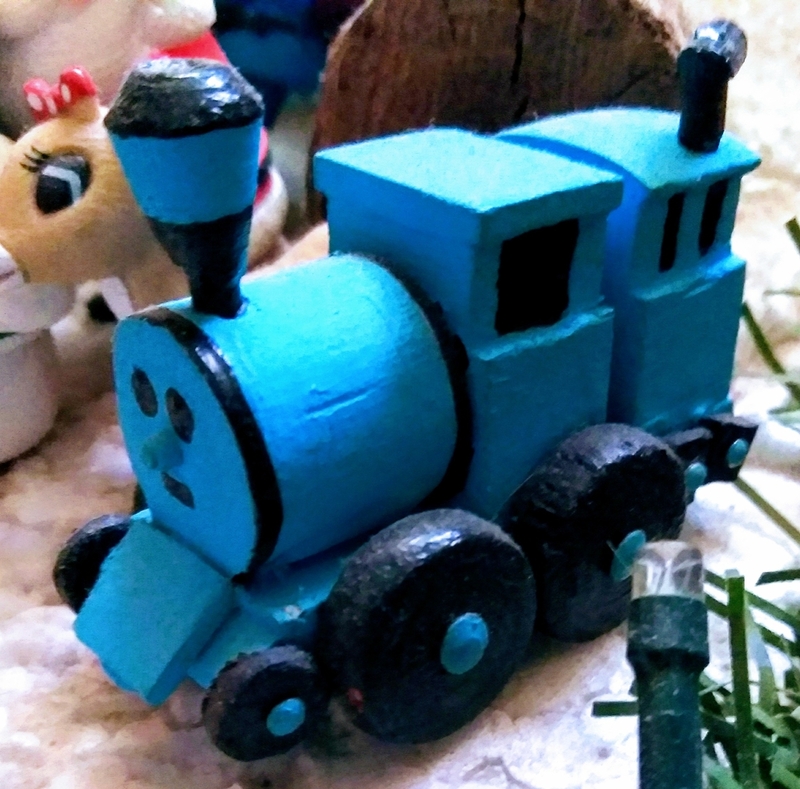 Those balls arent glue to the top, there is a fan. Ever cut, work or polish stainless to a mirror? It's hard working material I promise you. There's more, but I've gotta wait till later. Remind me with another post eh? I made a tin plate Christmas Train. The Sled is made from Precission Board. I love what you guys have done. 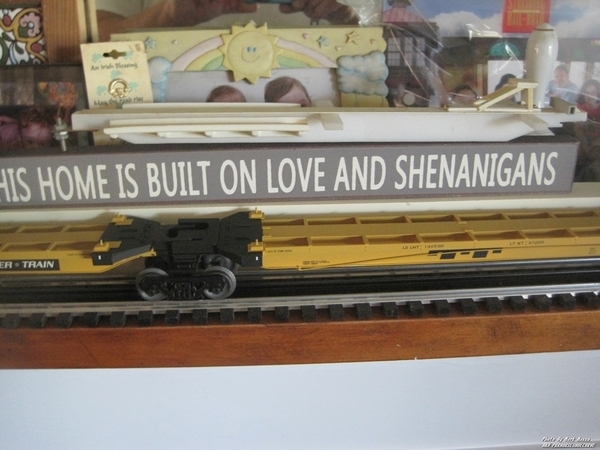 This is nowhere near as creative, simply added the details that MTH "forgot"on their TOFC flats. Like Lee above I used square styrene for stakes and sheet styrene for the sides of the guardrails. Each stake had to be tapered to fit in the pockets. To simulate wood rails the sides were scraped with a razor saw. Lionel ramps were added and the cars lowered to bring them closer in height to Lionel and Weaver cars. So far I have done 6 cars. 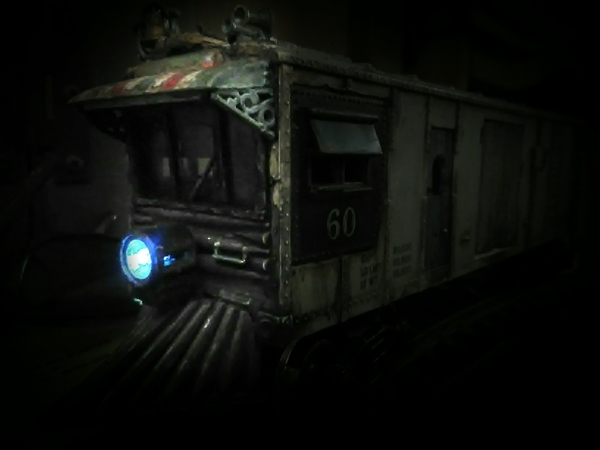 I want to see more of the Walker Express car. Is there a link, video etc.? very nice! 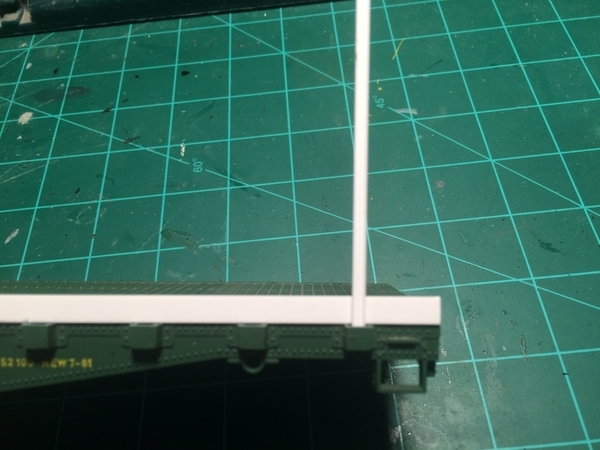 I like the old school Razor saw method to make styrene look like wood thats been around for years thanks for posting it. 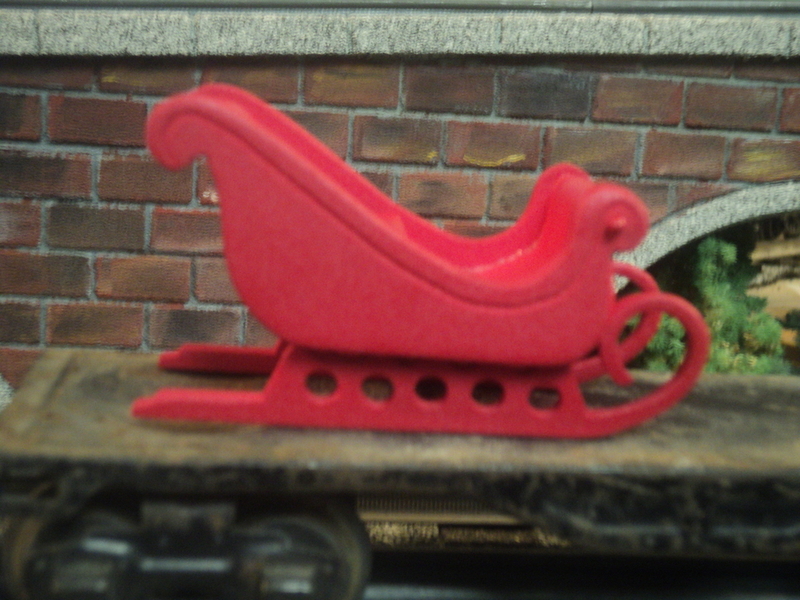 I checked lionel still sells the piggyback ramps but I cannot find any piggyback ACF hitches. 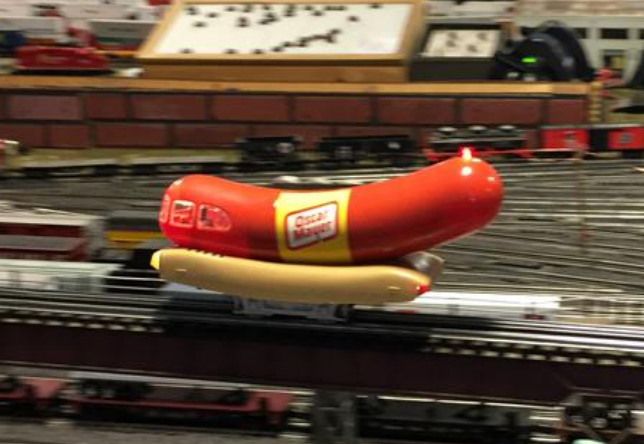 Does MTH sell those and the wheel chocks separate? Thanks you did a great job! Thanks Lee. I think at one time Lionel sold the hitches but no more. I have not checked to see if MTH sells them. The chocks should be easy to make. I suspect a plain platform with a hole in would work for a hitch as its mostly covered by the trailer. 192 stakes and counting. I no longer buy MTH flats unless they are close to free. As requested, a few more pictures of the auto loader. 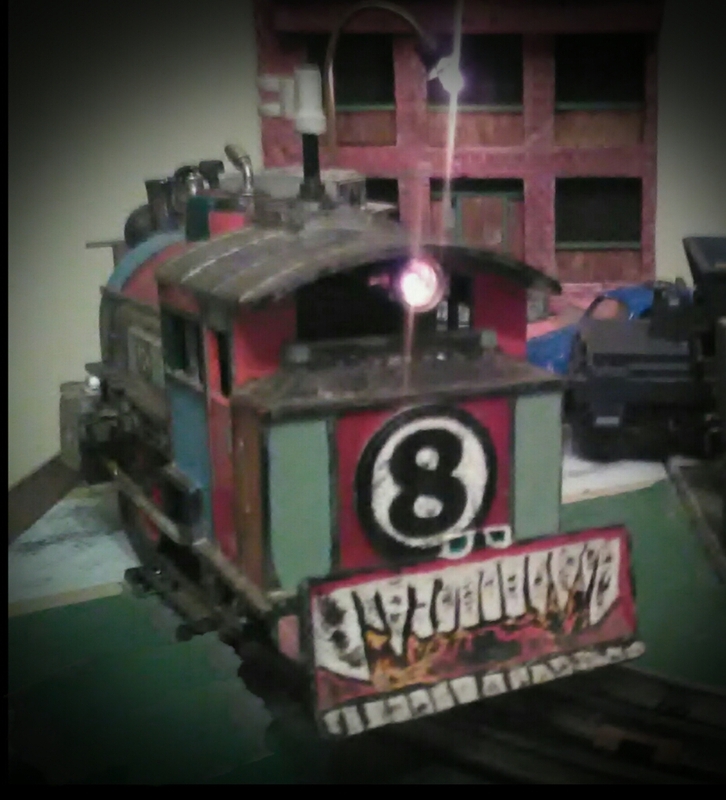 SWEEP (SW cab and GP7 long hood. Here's my home made version of Walt Disneys favorite rail car, The Retlaw 101 from Disneyland! And here is it being pulled by his favorite loco, my home made E.P. Ripley. Lego caboose from plans found online. 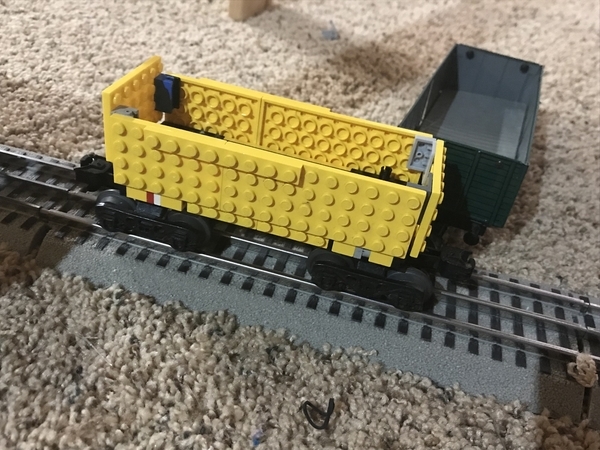 Mpc era plastic trucks slightly modified to accept Lego pins. 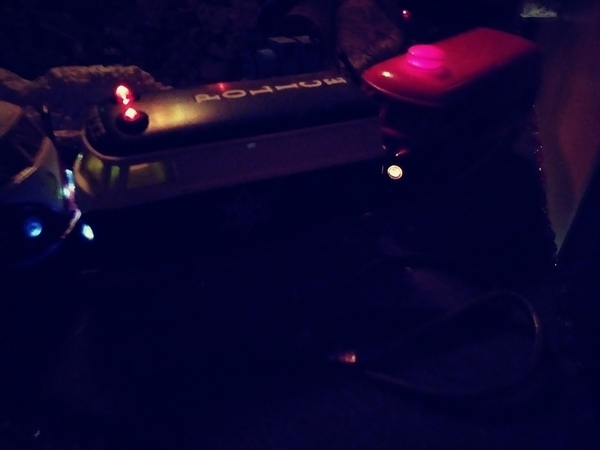 Tinplate to lobster claw transition car. A quick Lego car for my son. Very nice open car and great job. Car looks real in that super picture. I bet that was a fun and rewarding project. I have really been enjoying every ones homemade cars: keep them coming. Homemaking cars has been one of the more enjoyable parts of the hobby for me. 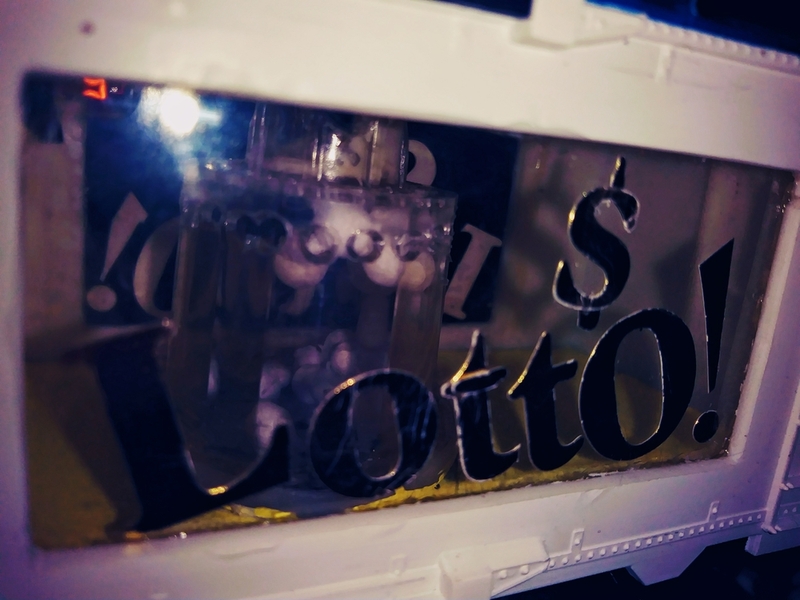 A homemade aquarium Car was made by cutting out the windows of a small Lionel box car like Gold Bullion car in a prior post. A Lionel Aquarium car sea background was purchased at a train show but one can be made from parchment paper. Plastic fish were cut out of clear plastic form old toy boxes and colored with Sharpies. The fish were suspended from the roof with 4 lb fish reel clear leader line and glued to the fish and roof with glass clear cement. 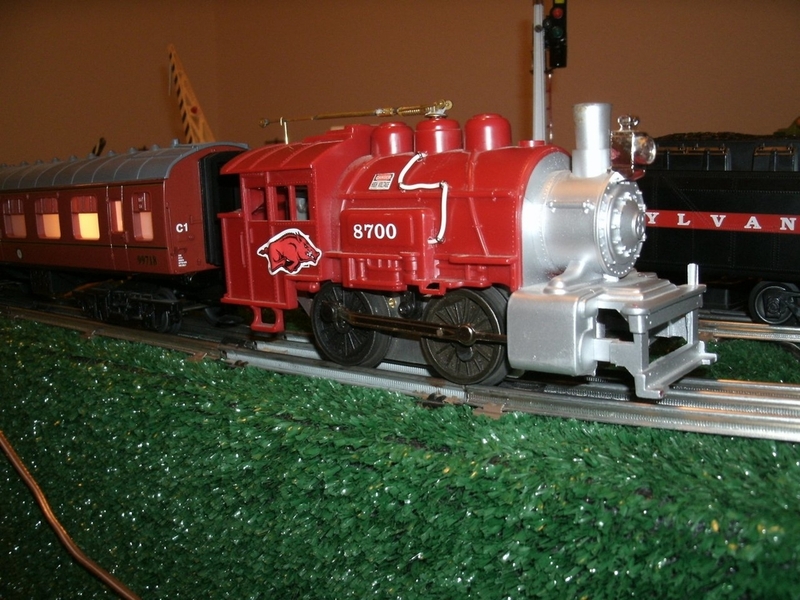 This allows the fish to wiggle and move with the train motion. Lights were added to the roof and a pickup made. This is my favorite home made car I have built. The action of the swinging fish is great when the car is moving and it has a smallish 027 size. 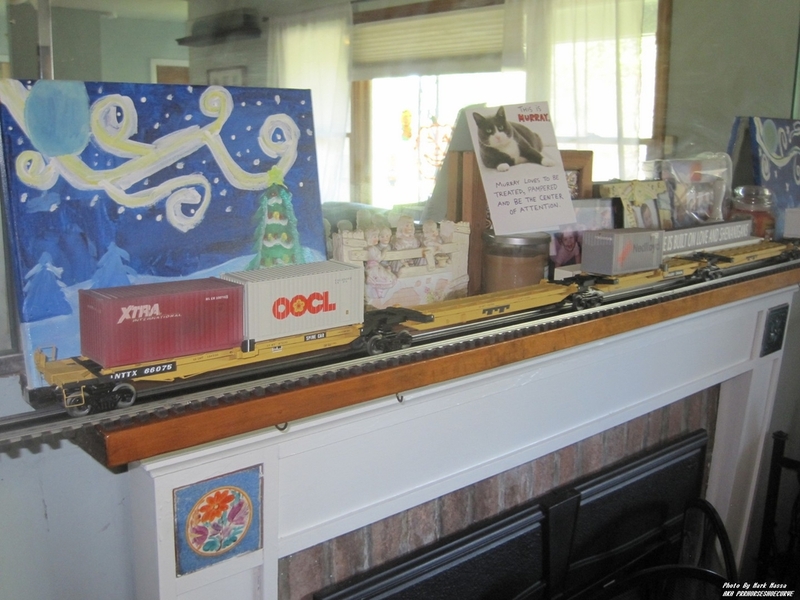 I have since purchased a Lionel Aquarium car but run this homemade one more often.